This post focuses on how to self-administer trigger point therapy for feet, specifically to relieve the pain of plantar fasciitis. The concept of trigger points will be introduced and then several videos will be presented to demonstrate the procedure used to find and eliminate appropriate trigger points. In a previous post entitled Deep Tissue Massage and Plantar Fasciitis the five primary techniques used in deep tissue massage were reviewed. 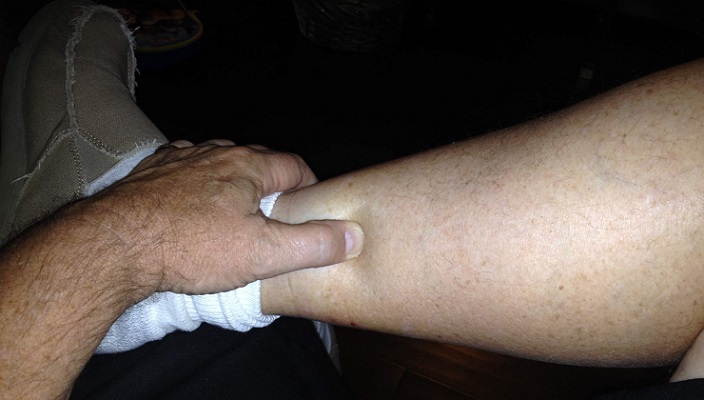 The third technique, Static Pressure, involves putting firm pressure onto a sore spot in your muscle with the intent to “release” the soreness. This procedure of applying static pressure is what is commonly known as trigger point therapy. There is a significant amount of information on the internet discussing trigger points. One article, simply titled Foot Pain, describes how trigger points began to be recognized in the healthcare profession and how they are related to foot and heel pain. Knowledge of trigger points exploded when, in 1983, doctors Janet Travell and David Simons published the first edition of Myofascial Pain and Dysfunction: The Trigger Point Manual. Trigger points can best be described as small areas of highly contracted muscles, or knots. According to Travell and Simons, knots are typically caused by either poorly conditioned muscles or ones that had been overworked. These isolated muscle knots often spasm. When they do, they cut off the blood supply to the area around them. And when that happens, you feel pain! Under certain conditions a collection of trigger points will build up in a small area of the body, resulting in what is called Myofascial Pain Syndrome (MPS). The following four-minute, animated video created by Alila Medical Media provides an excellent overview of trigger points, MPS, and techniques to release the trigger points. Muscle knots, or trigger points, are the most common reason for pain found in the feet, toes, and ankles. 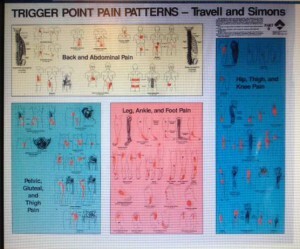 Research by Travell and Simons revealed that in 75% of all cases the primary cause of pain was due to trigger points. Additionally, they discovered that trigger points were involved in almost every situation involving pain. Most importantly, they showed that trigger points held a secret. These muscle knots tended to “refer” their pain, that is, they sent their pain to a different spot in the body. With regard to heel pain, the doctors described how trigger points in the soleus muscle, a muscle in the calf, referred pain to the heel. Really? Muscle knots in the soleus cause heel pain? According to Travell and Simons, the eleven muscles in our lower leg should be considered as foot muscles. What does this mean? It means that your foot pain might not stem from your foot at all. The pain may be coming from your lower leg muscles. Obviously, if that is the case, no amount of rubbing or soaking your feet will get rid of the pain. That being the case, we need to learn how to “release” the trigger points in our calf muscles and make the sore spots disappear. 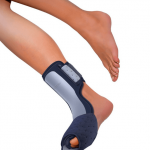 Doing so can help take care of existing plantar fasciitis pain. Longer term, it can help prevent such pain from reoccurring. Deactivating trigger points in your calf muscles can result in significant pain relief. To do this, of course, you need to locate the area on your soleus muscle that needs attention. A map of trigger points on the body, based on the type of pain you are dealing with, can help you find the correct location. For example, the map of trigger points that may be responsible for plantar fasciitis morning pain shows trigger points in the tibialis posterior, flexor digitorum longus, and flexor hallucis longus. Meanwhile, the primary symptoms for heel pain suggest trigger points in the soleus, quadratus plantae, and abductor hallucis muscles. Of course, each person’s body may be slightly different. The soleus is a common source of trigger points that refer pain to the heel. In the following videos (one and two minutes, respectively) you will see how to locate the soleus trigger point on your own leg. Even so, he still notes that massage can relieve some amount of pain inexpensively and safely. In the article Basic Self-Massage Tips for Myofascial Trigger Points, he promotes the idea of learning basic self-massage for the relief of most trigger point pain. Ingraham indicates that most trigger points can be stimulated by any type of massaging action that focuses, even briefly, on the spot of pain. He notes that most will “release” with as little as 30 seconds of trigger point massage. The key is that this isn’t rocket science and anyone can do it. The previous videos showed you how to use your thumbs to put pressure on trigger points. There are also a number of tools or devices that can be utilized to help gain better access to trigger points in your leg muscles. The following two-minute video shows how to use a block and/or tennis ball for this purpose. You can also purchase devices that have been developed for the purpose of massaging muscles and releasing trigger points. Trigger point (TP) balls, exercise blocks, and trigger point therapy rollers are among the products available for purchase. More will be covered on these in the products section of this site. I would love to hear from you. Please share experiences you might have had with trigger point therapy, especially if those experiences are related to calf muscle trigger points. Did the therapy do any good? How long did it take for the pain to subside? Share your comments and opinions in the comment area below. Thank you so much for your post. I suffer from heel pain, I’m pretty sure which is caused by my shoes, and from driving for hours upon hours. I definitely feel pain in my calf, hamstring and hip as well. Your article is very useful and informative. I’m definitely going to look into trigger point therapy to help my pain. Benjamin, I know that when my fasciitis pain was at it’s worst, driving the car was one of the most painful things I had to do. It usually hurt a bit while I was driving but every time I stopped and got out of the car it was like getting up in the morning – sharp pain, almost debilitating. I bought some soft-soled crocs to wear whenever I could and that helped. But that didn’t cut the pain caused by driving. I do hope that trigger point therapy might be helpful. If there is any chance that you can change to softer-soled shoes, that would probably be helpful also. Obviously, I’m not a doctor, so you might want to consider getting a professional opinion. Thanks for sharing this. I have recently had some troubles with heel pain. It’s o.k. now but was looking for something to prevent it coming back. Have bookmarked your post so I can back and try this trigger point therapy if the issue does arise again. Do you think it’s better to go with the trigger point tools or is using your thumbs just as effective? Sorry to hear you’ve suffered with heel pain also, Nate. It’s a nasty difficulty when it flares up. From all the research I’ve done to this point, trigger points appear to be a common reason for the pain. Since I first had my bout with plantar fasciitis, I’ve discovered that my Achilles tendon and leg muscles are usually quite tight. That was before I understood trigger point therapy. When I started trying these techniques on my own, I felt a lot of pain in those trigger point areas. So, I’ve concluded that my leg muscles and tendons may have had a lot to do with the initiation of my heel pain, along with the sandals I was wearing when it flared up. Is it better to use thumbs or tools? I think it’s a bit easier to find the trigger points using thumbs, however, my thumbs get very tired quickly. For that reason, using tools such as a ball or block can be more effective because I can work the muscles for a longer period of time without degradation of pressure. By the way, you might also want to look at a couple of the massage exercises in an earlier post called Massage Self Treatment. Hi, this is a very interesting site. You provide so much valuable information about trigger ponts. I have Endometriosis and I have Interstitial Cystitus which cause really bad cramps in my pelvic area.Do you think trigger point therapy can help this pain? I am in so much pain at times, all I want to do is lay down. So sorry to hear about these issues, Nicole. Honestly, I knew nothing about these types of problems before doing a bit of research. Since I am not a doctor or a therapist I can only respond based on what I’ve been able to ascertain from some study on the internet. Can trigger point therapy help this type of pain? It appears that it is possible. To check this out for yourself, google “endometriosis and trigger points” as well as “interstitial cystitus and trigger points”. The Interstitial Cystitus Association has a good article on physical therapy that discusses trigger point and deep tissue massage as good techniques for releasing tight spots (knots). Similarly, the Women’s Health Foundation has an article titled “Physical Therapy is an Effective Treatment for Endometriosis”. Note that both articles emphasize the need to engage a physical therapist who understands the massage techniques needed for these issues. One also gives tips on how to go about finding an appropriate therapist. Wow you have a lot of information in this post. I really enjoyed reading it and I learned a lot. My mother suffers from heel pain and she has for years. I know that with her, the pain will come and go a lot. Sometimes it hurts for a week then it might go away for a few weeks. She has seen a doctor about it but hasn’t had much luck getting rid of the pain all together. I’ll surely be directing her to your website for some advice. Hi Robert. Thanks for sharing. It’s interesting that your mother’s heel pain comes and goes. I suppose it could have something to do with certain types of activity setting off the pain or certain shoes she might wear once in a while. The fact that it isn’t consistent could be signaling that her issue isn’t plantar fasciitis. At least I haven’t seen much about that type of pain coming and going, it’s usually more consistent. I’m glad to hear that the information here was helpful. These massage techniques, along with the techniques in Massage Self Treatment for Heel Pain Relief, are certainly worth trying. If the pain is being referred from somewhere else the leg muscles could be suspect. OMG, this page has certainly saved me much pain. I’ve begun practicing the techniques here and it has made so much difference in my left ankle and foot. I dislocated my ankle and broke my tibia in one place and fibula in two places. It has been two years and I still get quite a bit of swelling and pain. Thank you very much! Hey Ray! You are very welcome, of course. First of all, so sorry to hear about your injuries. Those are pretty severe! On the other hand, I’m very happy to know that trigger point has helped reduce the pain. Hearing about good results helps to verify that the techniques work. I know they won’t always be the answer to every situation but I’m glad it’s working for you! This was a really interesting article – being a distance runner I often end up lying on the sofa for days with feet and ankle problems. I had no idea the pressure points for your ankle were located so far up the lower leg – very handy information. Tell me, is there any preventitive measures a runner could take to keep ankles pain free? Hi Chris. That’s a really good question. Since I’m not a runner myself and I have focused more on heel pain, I had to do a bit of research to help answer this one. There are, by the way, a number of good sites devoted to running that might be good to review. I did find a good article at Livestrong.com that mentions starting with the RICE method, stretching your calf muscles, and doing ankle circles among other things. Another very good site to look into is RunnersWorld.com. You can find several articles there devoted to ankle pain caused by running. Basically, both sites differentiate between a sprain, tendonitis, or more severe injuries. For general pain, they suggest resting it before exercising further, icing, using compression, and elevating, then getting into a routine of helpful exercises to eliminate tight leg muscles. This was a very interesting and informative post and I am so thankful I found it. I work in the restaurant business and that requires em standing for extended periods of time. That has as a result my feeling intense pain on my heels sometimes at the end of the day. I usually just apply some lotion that promises to relieve pain but had no idea about the trigger points and I am so surprised! This sounds amazing and I will definitely try pressing on those spots every night. Thank you for sharing this info and thank you for the video too. It helps a lot! Hi Katerina – Standing for extended periods, especially on hard floors, is a common issue that can lead to heel pain. Give the trigger points a try. It very well could be that your calf muscles are tightening on you due to standing so much. You might also want to look at a few of the other treatment options, just in case the trigger point massage isn’t the answer. Comfortable shoes can make a huge difference, although I realize you may be restricted in what you are allowed to wear on your feet. If you experience swelling of your feet then some general treatments may help: icing and/or elevating your feet. Come back at some point and let us know if the trigger point massage is helping. Thanks for sharing! Wonderfully informative article. A colleague of mine has been having lots of trouble walking, but visits to her doctor haven’t seemed to help much. A recommendation of pain relief medication is not the answer she’s seeking. She hasn’t been able to find a cause, or even really understand how, or why this pain has developed. I’m going to pass this information on to her, in the hopes it will offer her some answers, and some relief. Thanks Hindy. I hope this information will at least stir up additional potential techniques to help relieve the pain your colleague is suffering with. If personal attention to trigger points doesn’t work, perhaps your colleague should consult a trained massage therapist. Since I started doing yoga regularly, I’ve really been noticing how pain in one part of the body can be due to some issue somewhere else entirely. Thank you for sharing this information about trigger point therapy! Next time I have foot pain, I’m going to try this method before I head to the medicine cabinet. It’s nice to know that we can do something to reduce pain ourselves. You are very welcome, Samantha. I’ve used the techniques myself quite often and they have proven to be helpful once I find the right spots. I definitely can feel “knots” in my calves. Thanks for your comment. I hadn’t tried any trigger point therapy until I started researching the topic. The videos were critical in helping me see how to find a trigger point. I’m glad to know that these were helpful to you also. You say that heel pain is rare where you live? What part of the world do you live in? Hello, thanks for sharing about trigger point therapy. 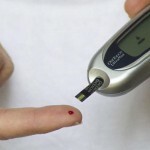 It is an interesting phenomena, showing us how little do we know about our bodies. it is strange how pain can radiate from trigger point to broader areas, far away from source of birth. There are some patterns, explaining why it happens. It is good to know that there are some methods which help to ease pain. The myotherapy, massage, tapotement, mechanical vibration are ways which help to treat muscle’s problems. It is great to see that stimulating a tiny spot on the foot helps to have a therapeutic effect. Overall, I think that it is a complex of treatments which can help with handling these trigger points. Thanks for explanation about these situations regarding trigger points. I find the trigger point therapy to be an extremely interesting concept myself, Nemira. I’ve done quite a bit of self-therapy, focusing on the trigger points in my calves, because I end up sitting a lot and my calves get tight. Our bodies are amazing machines! I have been doing some foot therapy for the past few months during to severe heel pain on both legs. Mind you, I don’t even wear heels at work, but I do stand and walk a lot. Perhaps I am wearing the wrong shoe. The trigger point for me is at the medial ankle and the posterior leg. My previous therapist used some kind of wood gadgets to relieve the pain, but I found the experience to be very uncomfortable. My current therapist only uses his fingers, thumbs and knuckles to relieve the soreness so it actually feels better. Thanks for sharing your experience with this. I’ve come across a number of different wooden “gadgets” that are intended to be helpful with massage or trigger point relief. Just from the looks of them it seems like some of them would be quite uncomfortable. I imagine they are all aimed at doing the same thing – finding and putting pressure on those trigger points. I’m glad you’ve found someone who can treat you more naturally and it’s working for you. I try to work on my trigger points fairly regularly because when I go too long without it, everything below my hips starts to get achy. My feet have been really sore lately, and a friend recommended trigger point therapy to me. 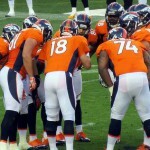 I thought this article was very interesting in showing the why behind the trigger point technique. I did not realize that muscles in the leg can cause that pain, as you described. I will be sure to keep this information in mind as I look into finding the right treatment for me! Thanks for sharing! Thanks for sharing, Annika. When I first learned about trigger points I was quite surprised also to find out that leg muscles could cause foot pain. Then again, I realized that I sit so much of the time and have the edge of chairs or car seats digging into my legs, so it isn’t all that surprising that our leg muscles get stiff and sore. I’ve utilized this technique on myself numerous times when I start getting pain in the bottom of my feet and it really has helped. I haven’t had heal pain in quite some time but when I did it was horrible. I wasn’t aware that there are pressure points to alleviate the pain. I would like to try these if I get pain again my feet. My real problem is that I have numbness in my feet. Do you know if any of these or any other methods to help numbness? I know someone who is having heel problems and I will tell them about these trigger point therapys. Rob, you’ve been busy reading on my site. I appreciate that because I know you are really seeking an answer. 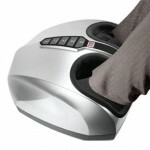 As I noted in my comment on the UComfy Shiatsu Heated Foot Massager post, relief of numbness may be determined according to the reason for the numbness (medical issue versus bad footwear or too much pressure on your feet each day). Assuming the numbness is caused by everyday abuse of your feet, Foot Massage Sticks and Rollers may be helpful, as would some of these other simple techniques discussed on this site (rolling your foot on a tennis ball, etc.) that can help stimulate the nerve endings. Try a couple of these techniques and see if it helps. If not, you might want to consider seeing a foot specialist, just to make sure. Hi Mohammad. One thing I know: plantar fasciitis issues can be complex; no single exercise, therapy, or treatment will resolve every person’s problems. If your calves are sore and you can feel the knots in the trigger points then working those points certainly should help relieve some of the pain, whether in your calves or feet. I’ve written about a number of different types of treatments, so it might be worth trying a couple of them for a week or so, just to see whether they provide relief. Try water bottle or tennis ball massage, for example. You might also try sleeping with a night splint, which helped me significantly (ask around and see if anyone has one you could borrow for a few days or purchase one). See if a couple of these simpler methods help you at all. Please come back in and let me know if anything works for you. You’ve given some great advice and the videos are great. I am a massage practitioner and my work and interest is mainly in trigger points. If you haven’t read The Trigger Point Therapy Workbook by Claire Davies I highly recommend it. I always tell my clients about it and have purchased several copies as I often give them away! I have suffered plantar fasciitis. For me going barefoot and/or wearing minimalist shoes and working on trigger points in my calves cured me.